Last year I spent some time on Facebook arguing with people who thought that the "Rhodes must fall" campaign was wrongheaded because it was erasing history. I suggested that putting a statue up to someone was generally (and in this case undoubtedly) not intended as a dispassionate recording of the fact that such-and-such had occurred, but rather a celebration of that person's life and deeds. In this case, the statue of Rhodes marks the approbation of the Oxford college he had endowed with some of his very ill-gotten African spoils. True, came the reply, but that approbation is itself a historical artefact, and to take down the statue is to erase it. Well then, why not put it in a museum, along with the other historical artefacts, and stick a label on it detailing exactly how Rhodes came by the money to endow colleges and scholarships? Why keep it in a place of honour, thus perpetuating the honour done to Rhodes? Of course, taking down a statue can never be more than a symbolic act, any more than raising it, or indeed keeping it. Symbolism is the currency of statues. To try and pretend that they naturally evolve into some kind of historical resource is profoundly disingenuous. (In the case of Rhodes, I don't think anyone tried to argue that the statue was a thing of beauty, but aesthetic arguments fall into much the same category.) Museums and art galleries are themselves far from politics-free zones, obviously, but at least they make some overt attempt to defuse and reframe such things as historical and/or aesthetic objects rather than direct political statements. In the end, Rhodes stayed of course, because Rhodes's successors (the college's current donors) threatened to withdraw funding if it was removed. ("Now I see, I see, / In Fulvia's death, how mine received shall be," as they put it.) As ever, money shouts. Anyway, I was just wondering to myself how the people I was arguing with on FB last year (nice liberal types, every one) feel about Trump making exactly the same arguments this week? Were they nodding along? If not, why not? As a tangential postscript, I gave my friend Haruka a lift to Brighton yesterday (I was helping my daughter move some of her things back to Bristol), and we stopped in at my mother's for a cup of tea en route. Haruka took this picture of my mother. It was only after five minutes that I noticed that it also includes her care assistant, Haawa. Talk about hidden black history! Can you spot her, readers? You got your smile from your Mum. People here that I know are not arguing to keep the statues up, but that they must come down "reasonably" or "by the city" or "by a vote." Personally, I don't care what happens to the statues, so long as they are taken down. I wish I'd offered a prize, now! Right above the... cigarette? Wow. How old is your mother? If I live that old, I'll start smoking again too! 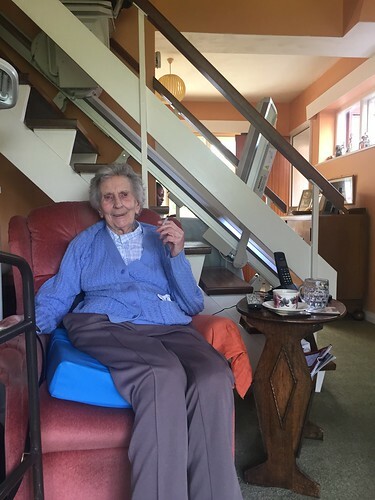 She's 92, but she offsets the deleterious effects of tobacco by drinking wine and sherry every day. Head level with your Mum's head.